Elna Baker found headscarves, henna, and smuggled hooch at her sister’s multicultural nuptials—not to mention a whole new sense of what family can be. Because my older sister Tina was marrying a Turkish Muslim instead of a fellow Mormon, the Mormon bishop at the microphone had been instructed not to use religious words in his sermon. “There is something…divine about marriage,” he stumbled awkwardly. I stood nearby in a red bridesmaid’s dress, looking out at my mother’s pious Mormon relatives and my father’s Mexican relations, among them two aunts who had smuggled in vodka in their water bottles. 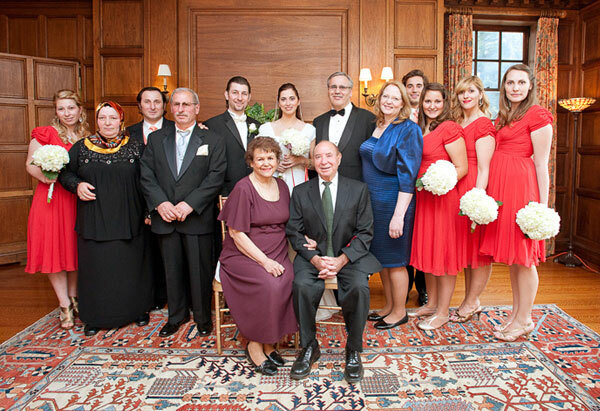 Across the aisle sat Mustafa’s Turkish family, the women in colorful headscarves. The night before, at a traditional henna ceremony, my mother and I had locked eyes as Tina’s head and face were covered with a black and gold veil, her hands bound with cloth bags. We’re an open-minded family, but we also saw Not Without My Daughter. My siblings and I had nontraditional Mormon childhoods, raised in Spain and London around all kinds of people. On holidays we alternated listening to the Mormon Tabernacle Choir and mariachi music, stories about Jesus visiting America and tales of my aunt Tafoya, who was once possessed. But we’d always been expected to marry within our faith, and live according to its teachings. Instead, I moved to New York to pursue stand-up comedy, and had recently—with dread over what it would do to my parents—stopped attending church. Tina had always been the “good” one. That’s why it was surprising when, at age 29, she fell in love with Mustafa after meeting him at a Greek restaurant in Boston. Unemployed, Turkish, and Muslim, he wasn’t exactly a Mormon parent’s dream, but he made her happier than any guy from church ever had. At first she tried to convert him, then decided that as long as he supported her faith, she’d support his. They were engaged in five months (my sister’s commitment to a genuine white wedding may have had something to do with the rush). As Mustafa’s cousin, speaking Turkish, pinned several $100 bills to the groom’s tuxedo, my relatives looked on, united in their confusion. And I felt a huge sense of relief. My sister had made an unexpected choice—and, in the process, proved our family could wrap its arms around more than I’d ever thought: Mexican-Mormon-Turkish-Muslim nieces and nephews, my dad’s convulsive attempts at traditional Turkish dance, and any other kind of happiness life might send our way. Thanks also to Project Interfaith http://www.projectinterfaithusa.org, @ProjectIntrf8th for letting me know about this story.